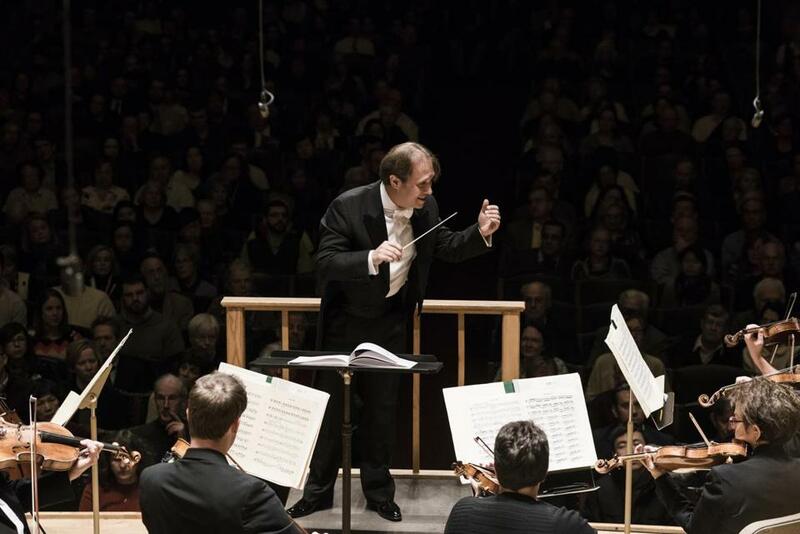 Ludovic Morlot conducts the Boston Symphony Orchestra on Thursday. The Boston Symphony Orchestra has commissioned some extraordinary music in its 135-year history, with Stravinsky’s “Symphony of Psalms” and Bartok’s “Concerto for Orchestra” only the most famous examples. Those two works have of course entered the standard repertoire, but unfortunately, the ensemble’s record of advocating for its other worthy commissions has been less consistently distinguished. One might hope that the considerable labor involved in bringing major scores into the world would, over the years, foster a deeper institutional sense of ownership, in the Lockean sense of the term, or at least a sense of stewardship. After all, if the commissioning forces do not advocate for these works and keep them before the ensemble’s public, who will? But against this backdrop, we can happily note that the orchestra’s current season offers a more appropriately robust serving from the archives than most, with major BSO-commissioned works by Dutilleux, Henze, and Martinu finding their ways onto programs. One of these scores — Martinu’s Sixth Symphony, titled “Fantaisies Symphoniques” — forms the centerpiece of this week’s program, in its first BSO performances since 2001. At least partial credit for the Martinu’s return surely goes to the distinguished Czech conductor Jiri Belohlavek, who assembled an all-Czech program for his scheduled guest appearances this week. As it turned out, Belohlavek was forced to withdraw for medical reasons and Ludovic Morlot stepped in to take his place on the podium. Morlot, well-known to local audiences from his time as a BSO assistant conductor, is these days cutting an impressive path as music director of a reinvigorated Seattle Symphony. In recent years, he has helped the BSO out of more than a few scheduling jams, and he did so this week in a manner that was particularly admirable. It was more than the assured and elegant performances he drew, but also his decision to leave Belohlavek’s program unchanged. A less diligent, less capable, or less conscientious maestro might easily have chosen to swap out the Martinu for a more familiar score requiring less intense preparation. Not Morlot. This absorbing work itself, premiered in 1955, suggests a slew of interwar and midcentury European influences thrown into a blender, but it also sounds like no one but Martinu. The music seems driven by complementary impulses, as it toggles between turbulent rhetorical drama and an airier sense of expressive fantasy. Morlot drew a forcefully articulated performance and brought out the richly layered qualities of the string writing in particular. At various moments, the score’s rapidly rippling woodwind figurations also seemed to gesture back toward the opening bars of the work that had begun the program. That was Smetana’s famously tuneful tone poem “The Moldau,” which here received a well-judged, handsomely drawn performance. After intermission came Dvorak’s Cello Concerto with the young German-Canadian cellist Johannes Moser. His playing unites a sleekly streamlined technique with an alert and in-the-moment musicality, and on this occasion his brisk forward-leaning tempos in the third movement in particular had the hall on the edge of its collective seat. The crowd wasted no time in rewarding him with a robust ovation.